Highlights of the Address by the President of India Shri Ram Nath Kovind to the joint sitting of two Houses of Parliament ! 2019 is an important milestone. India celebrates the 150th birth anniversary of Mahatma Gandhi, the Father of the Nation. 13th April this year marks 100 years of the tragic massacre at Jallianwala Bagh. Tribute to the martyrs who sacrificed their lives for a bright future for us. Nation celebrates 70th anniversary of the Constitution Day this year. 550th birth anniversary of Guru Nanak Devji this year. He taught us to lead our lives with the spirit of service and goodwill. Nation is following the dreams of Gandhiji to build an inclusive society based on ethics and principles. Nation is moving ahead guided by the ideals of social and economic justice as enshrined in the Constitution by Baba Saheb Dr. Bhimrao Ambedkar. Under the Swachh Bharat Abhiyan, more than 9 crore toilets have been constructed. Coverage of rural sanitation that was less than 40 percent in 2014, has increased to 98 percent. According to an assessment, because of the toilets built, numerous poor persons have been spared of various kind of diseases and more than 3 lakh lives have been saved. Many of mothers, sisters and daughters used to suffer from various illnesses because of smoke filled kitchens, which also affected health of the entire family; and much of their effort and time were spent in collecting firewood. Government has provided more than 6 crore cooking gas connections to such sisters and daughters under the Ujjwala Yojana. Under the world’s biggest health care scheme, ‘Pradhan Mantri Jan Aarogya Abhiyan’, 50 crore poor are eligible for availing treatment up to Rs 5 lakh per year per family in case of a serious illness. In a short period of four months, more than 10 lakh poor have already availed free treatment from hospitals under this scheme. Government has launched the National Nutrition Mission for persons suffering from malnutrition and to eliminate the factors responsible for malnutrition. ‘Mission Indradhanush’ has been launched by the Government to provide immunisation facilities to children and pregnant women living in remote and tribal areas. As a result, the country has moved rapidly towards the target of “Universal Immunization”. From Madurai in Tamil Nadu to Pulwama in Jammu-Kashmir; and from Rajkot in Gujarat to Kamrup in Assam, new ‘AIIMS’ are being established. Government is setting up New Ayurveda Science Institutes and encouraging yoga for physical and mental wellbeing. In the last four-and-a-half years, 1 crore and 30 lakh homes have been constructed under the rural housing schemes of the Government, whereas in the five years preceding 2014, only 25 lakh houses had been constructed..
By enacting RERA law, Government has ensured that construction of houses is completed and they are handed over to the buyers as scheduled so that the hard earned money of buyers does not get stuck. After enactment of this law, about 35 thousand ‘Real Estate Projects’ have been registered where lakhs of houses are being constructed and handed over to families. Under ‘Pradhan Mantri Awas Yojana’, the Government is also giving interest subsidy of 6 and a half per cent to the persons belonging to low income group. Today every village has been electrified. Under ‘Pradhan Mantri Saubhagya Yojana’, 2 crore and 47 lakh homes have been provided electricity connection. Ministry of Social Justice and Empowerment established by Atalji had started the tradition of organising camps to assist the Divyangjans. In the past four-and-a-half years, Government has been organising 140 camps on an average every month where Divyangjans are receiving assistive equipments. During this period, assistive equipments worth Rs 700 crore have been distributed to about 12 lakh Divyangjans in a fully transparent manner. Government under the ‘Sugamya Bharat Abhiyan’ has made about 1,000 Government buildings and more than 650 railway stations fully accessible to Divyangjans. Government started working on a uniform sign language for Divyangjan applicable throughout the country. Through the enactment of ‘The Rights of Persons with Disabilities Act, 2016’, Government has provided them with equal opportunity in education, social security and employment. A historic decision has been taken in the last Winter Session of Parliament to pass the 103rd Amendment to the Constitution to extend the benefit of reservation to the poor belonging to the general category. Keeping in mind the desire of the youth to be self-reliant, the Kaushal Vikas Abhiyan was launched. Under this Abhiyan, in the last four years, on an average one crore youth have been trained every year in different skills. Pradhan Mantri Mudra Yojana Under the ‘Pradhan Mantri Mudra Yojana’, which facilitates credit for professional and business requirements, loans worth more than Rs. 7 lakh crore have been disbursed to the youth without any guarantee. More than 15 crore people have benefitted and over 4 crore 26 lakh first time borrowers have started their business under this scheme. Under ‘Start Up India’ and ‘Stand Up India’, Government has provided financial assistance to make the youth self-reliant. As a result, in the world of start ups, India now figures as a frontline country. The Government has linked creation of jobs with tax incentives under ‘Pradhan Mantri Rojgar Protsahan Yojana’. Under this scheme, when a young person gets a new job, the EPS and EPF contribution of 12 per cent payable by the employer is being paid by the Government for the first three years. More than 1 crore youth have already benefitted from this scheme. 7 IITs, 7 IIMs, 14 IIITs, 1 NIT and 4 NIDs are being established. It has been decided to enhance the amount of scholarship and fellowship by more than 25 percent to encourage research activities in the country. Opening up of 103 Kendriya Vidyalayas and setting up of , Eklavya Model Awasiya Vidyalayas in all talukas having a majority tribal population and 62 new Navodaya Vidyalayas. The Government is setting up more than 5,000 ‘Atal Tinkering Labs’ for taking ideas to innovation. Government is making efforts to identify talented sportspersons from different corners of this country under the youth centric ‘Khelo India’ programme. Under the ‘Pradhan Mantri Mudra Yojana’, the maximum benefit has been availed by women. Out of the 15 crore Mudra loans provided so far throughout the country, 73 percent have been disbursed to women entrepreneurs. Under the ‘Deen Dayal Antyodaya Yojana’, about 6 crore women have become members of Self Help Groups. Government has provided loans worth more than Rs 75 thousand crore to such Self Help Groups. This amount is two and a half times more than the loans given in the four years preceding 2014. It has been made mandatory for the major Government companies to purchase at least 3 percent of their material from the enterprises owned by women entrepreneurs. Women officers recruited under the Short Service Commission in the armed forces to be considered for permanent commission through a transparent selection process just like their male counterparts. Enhanced maternity leave from 12 weeks to 26 weeks. Government is striving day and night to attain the goal of doubling farmers income. better facilities and assistance to farmers for the agriculture activities from purchase of equipment and seed to transportation of produce and its sale. Providing the farmers with fair price for their crops, access to new markets and helping them with additional sources of income. Government has taken the historic decision of fixing the Minimum Support Price – MSP of 22 crops at one and a half times higher than the production cost of the crop. The number of Krishi Vigyan Kendras is being increased across the country to assist the farmers with scientific methods of farming. More than 17 crore Soil Health Cards have been distributed to inform the farmers about the health of the soil. 100 percent Neem coating of urea has been done to facilitate its availability and to prevent its misuse. Government is completing 99 incomplete old irrigation projects so that farmers do not face any hurdle in irrigation. 71 of these projects will be completed by the next few months. Micro- irrigation is also being promoted by the Government to ensure full utilisation of every drop of water. Crop insurance is being provided to farmers at low premium under the ‘Pradhan Mantri Fasal Bima Yojana’ to safeguard them from potential crisis due to crop damage. A campaign has been launched to link online, more than 1,500 Agricultural Mandis to facilitate market access to farmers. Cold storage capacities are being increased at a fast pace to minimise crop damage from the field to the market and to ensure proper storage. The ‘Waste to Wealth’ campaign is being implemented to ensure that farmers generate additional income out of the crop residue from their field. Under the Blue Revolution scheme, Government is providing training to fishermen in deep sea fishing and financial assistance for buying modern fishing trawlers. Under the ‘Namami Gange Mission’, projects worth Rs 25,500 crore have been approved so far. Government is engaged with the task of cleaning up of the river Ganga by diverting dozens of major drains, stopping flow of industrial effluents and by setting up several Sewage Treatment Plants in the cities. In 2014, only 59 village panchayats in the country had digital connectivity. Today, 1 lakh 16. Thousand village panchayats are connected with optical fibre and about 40 thousand village panchayats have been provided with wi-fi hotspots. In 2014 there were only 84 thousand Common Service Centres. Today, their number has increased to more than 3 lakhs. Of these, 2 lakh and 12 thousand centres have been set up in village panchayats. Government has worked continuously to strengthen the spirit of Cooperative Federalism enshrined in the Constitution. In line with this objective, Government took the decision to provide the States with 10 percent additional share in taxes as per the recommendations of the Finance Commission. 34 crore bank accounts have been opened in the country because of ‘Jan DhanYojana’ and almost every family is now connected to the banking system.According to an international agency, of all the bank accounts opened in the world from 2014 to 2017, 55 percent were opened in India alone. Today, Rs 88 thousand crore deposited in Jan Dhan accounts is a testimony to the changing saving habits. It is only because of the Jan Dhan scheme that wages from MGNREGA, benefits from different insurance schemes, scholarships, pensions and most other Government benefits are being credited directly into the bank accounts of the poor through DBT. Approved constitution of a Special Investigation Team- SIT on black money. New agreements were signed with several countries known as tax havens, and several others were signed with many other countries to rectify deficiencies in existing agreements. New laws were enacted for sectors thriving on black money, and those were brought under the ambit of taxation. Government also provided an opportunity to voluntarily disclose unaccounted income and wealth. Demonetisation was a defining moment in the Government’s war on corruption and black money. The registration of 3 lakh 38 thousand dubious shell companies responsible for flow of black money have been annulled by the Government. Assets worth more than Rs 50 thousand crore are being confiscated under the Benami Property Act, Prevention of Money Laundering Act and the law against fugitive economic offenders. Whereas prior to 2014, 3.8 crore people had filed their return, this number has increased and more than 6.8 crore people have come forward to file their returns. Today, the tax payer is confident that each paisa contributed by him or her is being spent honestly on nation building. As a result of the expansion in Direct Benefit Transfer in the last four and a half years, more than Rs 6 lakh 5 thousand crore have been directly transferred to the bank accounts of beneficiaries. Because of this, about Rs. 1 lakh 10 thousand crore have been saved from falling into wrong hands. Government has removed about 8 crore fictitious names which were being used by middlemen to misappropriate the rightful benefits of genuine beneficiaries. Now with the implementation of a comprehensive tax reform like the GST, the concept of ‘One Nation-One Tax-One Market’ has been realised. As a result of reforms, India’s position has improved by 65 places in the Ease of Doing Business ranking, from 142 in 2014 to 77 now. During the last four and a half years, the economy of the country has been growing at a rate of 7.3 percent on an average. India is playing a significant role in international trade. While India’s contribution to the world GDP was 2.6 percent in 2014, it has increased to 3.3 percent in 2017 as per the latest reports. India has emerged as the 6th largest economy in the world. Now India is the 2nd largest manufacturer of mobile phones in the world. Recently, the milestone of converting diesel locomotives into 10 thousand horsepower electric engines has also been established by India. As a part of Make in India initiative, Asia’s largest MedTech Zone is being established in Andhra Pradesh. Defence Corridors are being established in Uttar Pradesh and Tamil Nadu, which will not only strengthen our security through establishment of production facilities for defence equipment, but also provide employment to the youth. Soon, the passengers will also be able to avail the ultra-modern facilities of our fastest train till date – ‘Vande Bharat Express’. This sector has seen a double digit growth during the last four years. More than 12 crore and 30 lakh people travelled by air during 2017-18 and this number is increasing constantly. Under the ‘Udan scheme’, 12 lakh seats have been made available to people at lower tariffs. This has provided the common person with an opportunity of air travel. Under the UdanYojana, 19 new airports are being built in Eastern India and of these 5 are coming up in the North East. The construction of Pakyong airport in Sikkim and Veer Surendra Sai Airport at Jharsuguda in Odisha has been completed. The work of reconstruction of fertilizers plants at Gorakhpur in Uttar Pradesh, Barauni in Bihar and Sindri in Jharkhand, which were closed for several years, is progressing rapidly. The ‘Urja Ganga Pariyojana’ started with an approximate outlay of Rs.13 thousand crores will help expand the industries based on gas pipeline in several cities of Eastern India. Similarly, the work on the ‘Gas Cracker Project’ which is important for Assam and Paradip Oil Refinery in Odisha has also been expedited. The DholaSadiya Bridge named after Bhupen Hazarika, linking Assam and Arunachal Pradesh has already been dedicated to the nation. Out of the 18 thousand villages electrified by the Government, about 13 thousand villages are in Eastern India and out of these 5 thousand villages are in the remote areas of the North-East. Almost all the railway lines of the North-East have been converted to broad-gauge. Efforts are underway to provide rail connectivity to the capital cities of all the 8 States. For this, the work on 15 new rail lines is under progress at a cost of approximately Rs.50 thousand crores. Through the surgical strike on cross border terror posts, India has shown its new policy and strategy. Last year India joined the handful of countries that possess the Nuclear Triad capability. Not only has Government fulfilled the demand for One Rank One Pension that had been pending for 4 decades, but it has also disbursed arrears amounting to more than Rs 10,700 crore to 20 lakh ex-servicemen. After a gap of many decades, the Indian Air Force is preparing to welcome, in the coming months, its new generation ultra-modern fighter aircraft Rafale and strengthen its strike capability. In the last few years, a record number of youngsters in the Maoist areas have come forward to join the mainstream. The Police Memorial, which was dedicated to the nation last year seeks to honour their sacrifice and also preserves the memories of their sacrifice for the future generations. As a result of the efforts of Government, an environment favourable to development has been created in the State. Recently, in Jammu and Kashmir, elections to Urban Local Bodies after an interval of 13 years and in Panchayats after 7 years have been conducted peacefully with more than 70 per cent voters participating enthusiastically. infrastructure, health and education sectors worth more than Rs.66 thousand crores have been approved so far. Government has dedicated to the nation the ‘National Salt Satyagraha Memorial’ at Dandi on the death anniversary of Mahatma Gandhi. 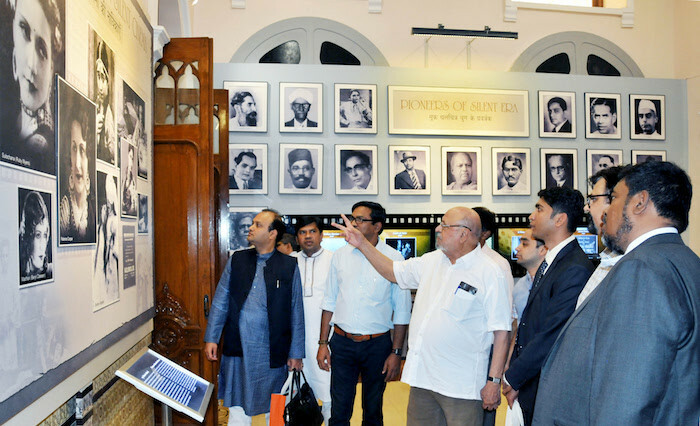 KrantiMandir, a museum in Delhi dedicated to Netaji Subhash Chandra Bose has been opened to public this month. The Government has also instituted Netaji Subhash Chandra Bose Disaster Management Award in his honour. The Government has developed 5 sacred places associated with Baba Saheb Ambedkar as “Panchteerth”. The nation has paid tribute to the Iron Man of India Sardar Patel, by building the ‘Statue of Unity’, which is the tallest statue in the world. Government is setting up museums in various States in the memory of the country’s tribal freedom fighters. Government has conferred the Bharat Ratna on Mahamana Madan Mohan Malaviya and Atal Bihari Vajpayee in 2015. This year it has been decided to confer Bharat Ratna on Nanaji Deshmukh, Bhupen Hazarika and Pranab Mukherjee. 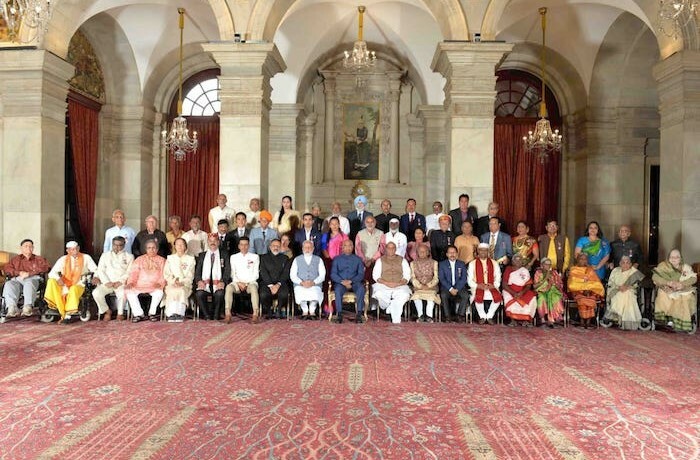 By conferring national awards on the basis of merit and without any discrimination to those citizens, who have worked selflessly for the welfare of the people, Government has demonstrated country’s commitment towards the ideals of sacrifice and service. In our tradition, the Saints and Gurus occupy the highest position. This month, to commemorate the Prakash Parv of Guru Govind Singhji, the Government has released a special coin. It is a measure of Government’s diplomatic success that today India’s voice is heard with respect at international fora. Pravasi Bharatiya Diwas organised recently in Varanasi has reinforced this fact. At the initiative of India, 21st June was declared as International Yoga Day by the United Nations and is now being celebrated with great enthusiasm across the world. During the last four years, more than 2 Lakh 26 thousand Indians stranded abroad have been rescued and brought back to the country. The United Nations Award for India’s efforts in the field of environment conservation has made every Indian proud. It is a matter of pride for all of us that India is providing leadership to the global solar revolution and last year the first summit of the International Solar Alliance was successfully organized in Delhi. In 2022, India will host the G-20 Summit. Hosting the summit in the year marking the 75th anniversary celebration of our independence will further enhance India’s global influence.